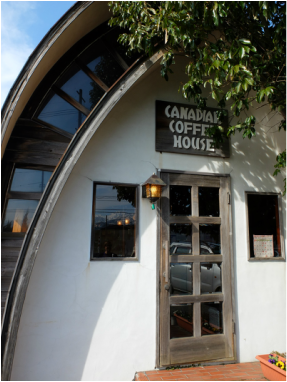 The Canadian Coffee House has been calling to me since the first time I noticed it, tucked away on the old Route 8 just slightly outside of Uozu proper. It's a tiny wooden building with a curved wooden roof, and you can just barely make out a faded stencil of the word "COFFEE" emblazoned on the shingles. This Saturday was the perfect day to start off my Toyama Cafe Crawl with a visit to the cafe that sparked the idea in my head in the first place. Unlike the TARDIS, The Canadian Coffee House is definitely not bigger on the inside. The tiny exterior gives you a very realistic idea of what to expect when you walk through the door. There are only three tables in the cafe, though there is a bar that runs the entire (and considerable) length of the restaurant. We settled down at the table farthest from the door. We were greeted by who I can only assume are the owners themselves--a lovely old Japanese couple who'd probably owned the place for years. Next time I go in--and there will definitely be a next time--I'd like to learn a little bit more about the building and the cafe. I'm not a coffee drinker, but I'd be more than satisfied by the Canadian Coffee House selection if I were. They had a broad selection of coffees from around the world (Sumatra, Guatemala, Hawaii, Mexico, and Brazil, to name a few) and they grind the beans to order. If you're looking for something other than coffee, they have a ton of juices and a variety of Twinings tea, as well as cream soda (!!) and milkshakes. They have a breakfast service for 500 yen and a lunch set for 700 yen if you're interested in food, and since we popped in around 12:30, we ordered the lunch set. I am clearly living in the wrong country. Anyway, the cheese toast was your average cheese toast, but the egg salad sandwich was really lovely. I can't speak to the ham sandwich, as I foisted mine off on my unlucky dining companion. The salad was tasty, though I'm not entirely sure why cabbage salad is quite so popular here. The dressing was nice and flavorful and the salad came with a slice of banana and a bunny apple on the side. By the time we were done eating, we were pleasantly full. The sun was shining like crazy yesterday, streaming in the window right to our table, so we felt a bit like lazy cats who'd just gorged ourselves on kibble and were settling in for a nice long nap. For most of our lunch, we had the whole place to ourselves. When we were almost finished eating, a group of older ladies came in to have some afternoon coffee. You could tell that they were regulars. Most of the small cafes in rural Japan are catered towards the elderly rather than the hip young folks, although I could see this coffee shop fitting in perfectly anywhere in Denver. The owners of this establishment were easily in their late sixties if not older. The Canadian Coffee House is a little too far outside of Uozu to be considered walkable from JR Uozu (unless you don't mind walking for at least an hour) but it does happen to be fairly close to the Nishiuozu Dentetsu Station. According to Google Maps, you can walk there in about ten minutes. If you don't mind hopping on your bike, you could probably make it out there without much fuss. For those of you who have a car like I do, just hop on 135. It's a tiny place, so you have to keep an eye out, but it's right on the road. If you're coming via Uozu, it's on the right about five minutes after the Apita. If you're coming from Namerikawa, it's going to be on your left a couple of minutes after you cross the Hayatsuki River (早月川). The parking lot is small, but so is the restaurant--if there isn't space for your car, there probably isn't space for you. Verdict? Fabulous. No actual Canadians. Peaceful, relaxing, beautiful old building. 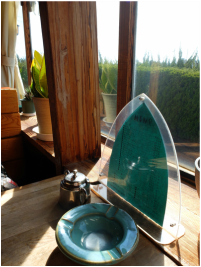 If you feel like taking a trip out toward Uozu, give The Canadian Coffee House a try! I often find myself passing little shops and cafes and thinking "I should check that place out one day!" This is the Toyama Cafe Crawl--my attempt to make "one day" right now.